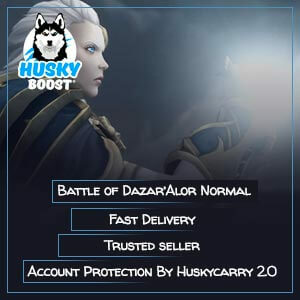 Hello there and welcome to the Battle of Dazar’Alor Mythic boost page! Reveal new ways of getting valuable equipment here. The division of the raid content made four separate difficulty levels. This system has been introduced quite a while ago and now it has a lot of followers and fans. Starting with the End of Pandaria expansion, we have four of them – looking for group mode, the easiest one, casual normal, challenging heroic and the most competitive – epic. First three modes are not related to the amount of the players in the group. It scales depending on the size of the party and the number of challenges. The minimum amount of players is ten and the maximum is thirty. You’ll be one of them after you buy Mythic Battle of Dazar’Alor run at our website. This mechanic helps people who enjoy playing as a stable 10-man group not search for additional recruits. Of course, the difficulty of the ultimate boss varies depending on the total heroes present. With the maximum amount of people in the instance, some bosses require at least six or seven healers. 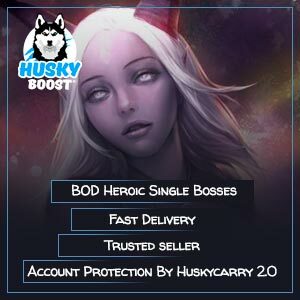 At the highest difficulty, especially in the latest raid, it’s necessary for everyone to do their job flawlessly to ensure the safe completion of the dungeon. 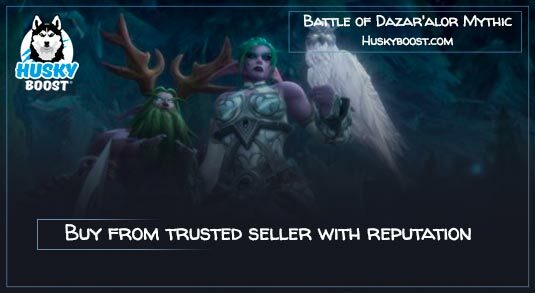 Hire a carry for sale and obtain some mythic loot from Battle of Dazar’Alor. This game mode is the hardest and requires every participant’s attention and carefulness. The boss has more abilities, his stats like damage and hit points are way higher and its intelligence is better. 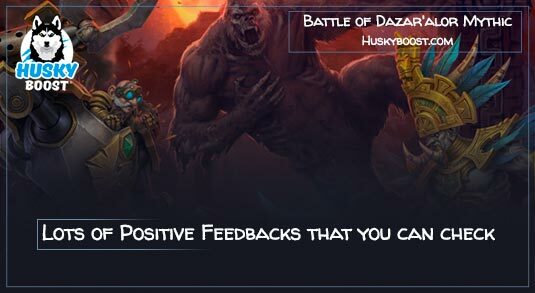 Battle of Dazar’Alor at the Mythic level is a perfect example of a well designed WoW challenge destined to boost your perception. Well, to put it bluntly, it’s plain stronger. However, the rewards are greater as well! It is also important to mention that the overall number of people who have completed an instance at that difficulty is incredibly low! Due to its challenges, only one or two percent of all World Of Warcraft players have ever succeeded in completing such an instance. So what awaits us in the latest addition? Naturally, four different levels and ways to finish the dungeon. As for today, we know that the location of the new dungeon shall reveal an impressive amount of unseen mechanics, dynamic immersive skirmishes and a new style of instances! Completing the Battle of Dazar’Alor trial without much trouble is only possible to a carry who mastered WoW mechanics. Only a few chosen ones shall be able to get through the struggle of walking through these challenges. And even fewer lucky heroes will be able to become proud possessors of an epic mount which drops from the final boss – Jaina Proudmoore! Now that’s a thing which will make you stand out! 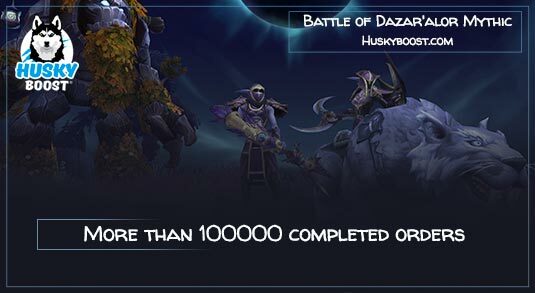 Our prices for services like Battle of Dazar’Alor completion at Mythic difficulty are fair. The new style of the instance brings a special feeling of difficulty and cruelty of the fight for the Horde’s capital. In order to strike down several certain enemies, heroes of Alliance will have to become champions of Horde. Naturally, it works both ways. It’s made this way to free the players from factional prejudices. You can always experience it yourself by getting some of our WoW Battle of Dazar’Alor runs. Even though a great amount of Warcraft’s community has already several awesome accounts with maxed out characters. Of course, they have already explored the justice of Alliance as well as the truth of Horde. However, keep in mind that there are many casual players or not so experienced yet. Anyway, all kinds of participants will inevitably learn about the weight of the war and carve everything into their memory with their own eyes. Putting lore part aside, there is some loot to worry about. Obviously, great pieces of equipment will drop after finishing this instance. But in order to become a part of a group to complete it, don’t forget to gear up first. Get your ilvl high enough with other WoW raid boosts. Don’t waste that an amazing moment and seize the opportunity today! Great service. They were busy the night I asked for, but nonetheless the run was very quick and smooth. Very friendly people that were in the group I was placed with. 10/10 would recommend to friends who are looking for carry. Bought a run through BOD to try out service. Went great. Run finished up fast and efficiently. Fantastic group and everything was good. Very quick and professional service, very responsive to enquirees and quick to correct any mistakes made.